Risa at 2.5 years of age when I brought her into my life. I’d always wanted a dog. I used to beg my parents endlessly for one but they held firm. It wasn’t until I got out of college and got a steady, well-paying job that I was finally able to fulfill my dream and get a dog. As soon as I had moved, I started looking. I knew I wanted a herding breed mix who was young but no longer a puppy. My apartment was on the 3rd floor so potty training was out of the question! I wanted to compete in dog sports, specifically agility, and knew I desired an active companion. The shelter was up front with me about her fear issues and she was also underweight. I felt up to the task of working with this dog to help her gain confidence. Though I’d never trained a dog before and knew it would take a lot of work, I was totally unprepared. Like, drowning in quicksand over my head. I tried my best to do some remedial socializing with her; get her out and about to see the world isn’t so scary. But I went about it all wrong. I had no relationship with her yet and I should have given her some time to adapt before thrusting her into situations she wasn’t ready to handle. While I was successful in teaching her basic behaviors like ‘sit’ and ‘down,’ I was failing miserably at making her life less scary. Fortunately, we signed up for a clicker training class several months after I adopted her. I hadn’t initially wanted to use a clicker. I didn’t want to have to carry around the stupid tool all the time and I believed my dog should do what I say because I told her to. 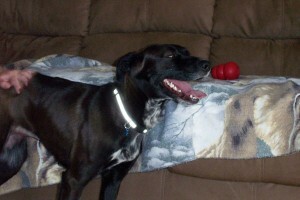 I was very resistant to the idea of clicker training at first but I attended classes and saw amazing results. Despite having success with clicker training, I was still reluctant to give up using the prong collar at first. We completed our “Head Start” class with flying colors. Though Risa cowered and wouldn’t let anyone approach her in the first couple classes, she had started to come out of her shell by the end. I was having so much fun training her that I signed us up for the Level 1 classes as soon as we graduated. After Level 1, we found out our trainer wasn’t going to offer agility classes like she had planned initially (not to mention Risa wasn’t ready for them). Instead she was going to offer canine freestyle. Much like my thoughts about clicker training at the beginning, I thought this was stupid too. Dancing with your dog? You’ve got to be joking. 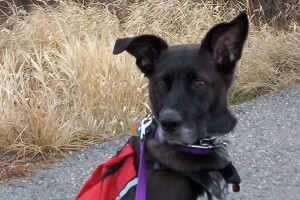 But I wanted to try something new with Risa; not just standard obedience classes. Along with enrolling in the Level 2 class we signed up for canine freestyle. It turned out that Risa is a dancing fool. Something about freestyle just clicked with her (pun intended). As stupid as I still thought it was, I couldn’t deny how much fun Risa was having with it. And so, I started to enjoy it too. We signed up for our trainer’s Level 3 and 4 classes, took some rally classes, performed two canine freestyle demos, attended seminars, did a practice therapy dog test, did an agility flatwork class, and became assistants to the “Head Start” classes. If our trainer offered a class, we took it. Risa enjoyed training so much that we became dog class junkies. 🙂 Despite having moved away from our first trainer, we still take classes and attend seminars whenever we can! Despite taking classes and having some time to socialize with other dogs and people, Risa was still very nervous and shy. She did not like strangers trying to pet her and she had become dog reactive. Her reactivity was very frustrating and scary. 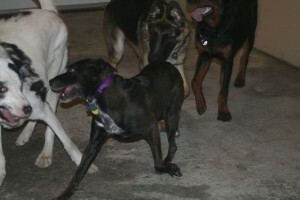 I was really confused as to what was going on and was having no luck curbing her behavior when it came to other dogs. Playing with puppies more than twice her weight. At the mere sight of another dog she would be lunging, barking, hackles raised, bouncing or spinning in place. It was embarrassing and I knew everyone was judging us when she acted like that. I tried everything I could think of to stop it including collar corrections and yelling. I was getting nowhere fast and was just making things worse! An online friend mentioned the book Scaredy Dog by Ali Brown which I picked up after reading several others. The light bulb finally turned on. Risa was reacting the way she did because she was AFRAID. It was so obvious, really. She’s always been a fearful dog. But her aggressive displays just didn’t seem like a frightened response to me. They were. I finally understood what I was dealing with and we FINALLY got on the right path. Of course, it was not easy. And, for what it’s worth, it still isn’t. 😉 I tried several methods to curb Risa’s reactions to other dogs. We slowly saw improvement. As time has gone on, I have refined my tools and learned what does and doesn’t work. While Risa is still dog reactive, she is a million times better than she used to be. She is able to walk past other dogs without losing her mind. We can be in close proximity to dogs and she can even greet them nicely. Risa is far from comfortable with her own kind. I think of her as a bit of a social misfit; that wallflower at the party who’s kind enough to introduce herself but then retreats to the safety of being alone. 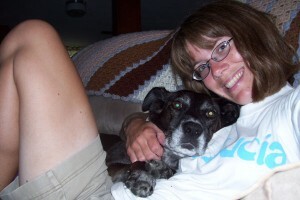 We’ve come a long way together, Risa and I. I thought I knew a lot about dog training before I got her. I was sure I knew how to read dogs too. Risa taught me how wrong I was and how much I still needed to learn. She’s an outstanding teacher and I owe her so much. In fact, I’ve learned more about myself from my interactions with her. I’ve become a better person. She forced me to step back and evaluate what I am doing. To calm myself before letting frustration and anger take over. Risa is an amazing dog. My Awesome Dog.